China’s dogged opposition to the potential deployment of an additional U.S. missile defense asset to South Korea has raised questions over Beijing’s true intensions, given that the interception system does not pose any serious security threat to China. Some assume the opposition to the Theater High-Altitude Area Defense system is intended to forestall any potential negative ramifications for China’s security. Others say the dissent appears designed to weaken the South Korea-U.S. alliance. 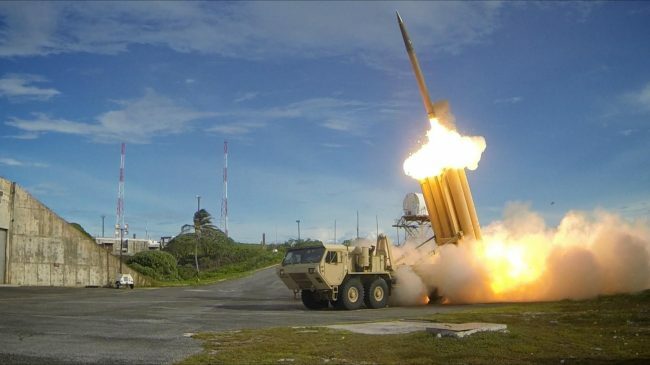 Despite the fact that THAAD is a wholly defensive system capable of targeting only North Korean missiles directed at South Korea, top Chinese officials ― most recently China’s Defense Minister Gen. Chang Wanquan ― have repeatedly voiced opposition to THAAD. Military experts say that, contrary to lingering speculations, THAAD could not shoot down Chinese intercontinental ballistic missiles headed for the U.S. mainland, or pose any missile threat to China, should it be based on the peninsula. 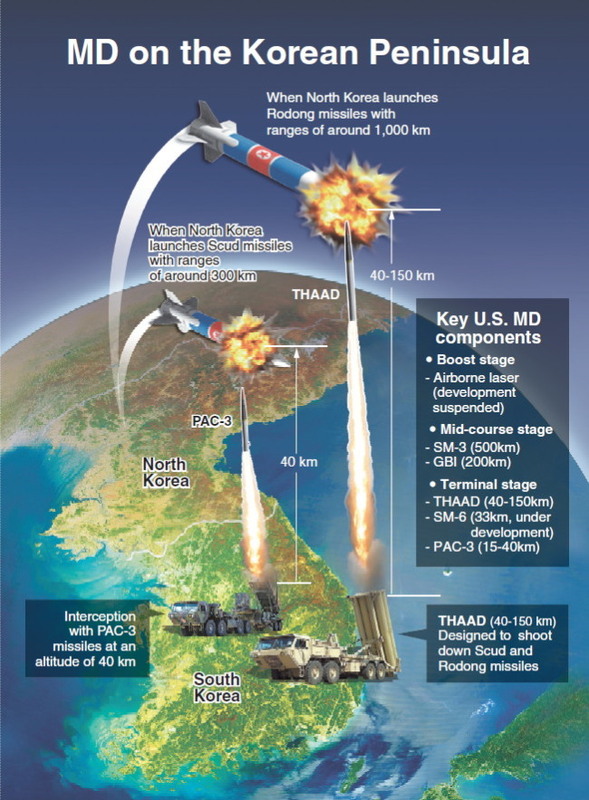 “The THAAD interceptor has a range of 200 kilometers. Its range means that a THAAD interceptor ― if based at Osan Air Base, a likely U.S. option (for the potential deployment) ― could not reach as far north as Pyongyang ― it would fall about 65 kilometers short,” said Bruce Bennett, a senior analyst at the U.S. think tank RAND Corp.
THAAD is designed to intercept incoming missiles at altitudes of 40-150 km after detecting the missiles with land-based radar that has a maximum range of about 1,800 km. But China’s long-range missiles would travel far above THAAD’s maximum altitudes. On top of this, THAAD is aimed at intercepting missiles falling toward Earth during their “terminal phase,” not missiles flying far beyond the peninsula. Apart from the altitude issue, THAAD’s operational range is too short to intercept Chinese or Russian missiles. China may take issue with the radar system with the argument that THAAD could be used to gather intelligence about Chinese military activities. But China is already under the scrutiny of a host of U.S. intelligence, surveillance and reconnaissance assets including military satellites, and vice versa. Then, what has been driving China’s complaints about the potential deployment of THAAD to Korea? There may be several answers to the question that involve China’s calculus of strategic national interests. In recent years, China has been enhancing its military capabilities to keep any hostile forces ― potentially U.S. troops ― at bay with cruise and ballistic missile, bombers, and other advanced weapons with longer operational ranges, and greater lethality, survivability and accuracy. China’s coastal regions are now strewn with state-of-the-art weapons systems, which have apparently signaled that any external forces that attempt to encroach upon its territory and hamper its advance farther into the Pacific would likely face strong military responses. U.S. officials have described such capabilities to fend off hostile approaches and project power beyond its shores as “antiaccess/area denial” capabilities. China may think the deployment of THAAD to the peninsula could potentially weaken its A2/AD capabilities, observers noted. “China views the introduction of THAAD in South Korea as a new capability that could potentially, in the long term, offset China’s ballistic missiles that serve as power projecting platforms, while increasing Beijing’s strategic and political leverage,” said Michael Raska, research fellow at the Institute of Defense and Strategic Studies, affiliated with Nanyang Technological University in Singapore. Antiaccess, or A2, refers to action that prevents a hostile military force from moving toward a specific operational area, while area denial, or AD, means action aimed at obstructing any maneuvering within the area. To overcome the A2/AD challenges, the U.S. has been exploring and devising a set of “offsetting” concepts in recent years with the aim of creating an efficient joint force capable of handling evolving security threats in all domains ― air, land, sea, space and cyberspace. Washington’s offsetting concepts are aimed at countering military challenges not just from China, but from all potential adversaries including Iran and North Korea. Among the U.S.’ operational concepts, AirSea Battle is the most publicized. Since Washington revealed its work on the concept in the Quadrennial Defense Review in 2010, it has run an AirSea Battle office to advance the concept and sought to develop its assets and force structure in line with the concept. A crucial element of the operational concept is sturdy missile defense as the missile shield would help enable U.S. forces to block hostile missiles and ensure their ability to gain access to operational areas and maneuver within the areas. Some experts speculate that China appears to have repeatedly voiced its opposition to THAAD as part of its campaign to weaken the long-standing alliance between Seoul and Washington. China may also attempt to probe South Korea to see what strategic choices it will make to avoid compromising its relations with Beijing, a crucial partner for Seoul in terms of trade, tourism and efforts to denuclearize North Korea, they noted. Bennett said that the “political rationale” of undercutting the alliance seems to be driving China’s complaints about the potential dispatch of THAAD here. “If the military justifications for China’s complaints do not make sense, it seems to me that the objectives behind China’s complaints are political; China is apparently trying to prevent South Korea and the U.S. from making our alliance even closer than it already is,” he said. Woo Jung-yeop, a research fellow with the think tank Asan Institute for Policy Studies, predicted that China’s attempts to hurt the Seoul-Washington alliance may continue, given that such attempts dovetail with China’s security goals. “Unlike the U.S., China has no (security) allies. Thus, weakening the U.S.’ alliance systems would be suited for its strategic goals. (I think) China intends to explore possibilities surrounding to what extent it can further pressure South Korea over alliance-related issues,” he wrote in a recent analysis published by the Jeju Peace Institute. Aside from the issue of THAAD, China has already pushed South Korea to make tough strategic choices on multiple fronts. Beijing has long objected to Seoul’s security collaboration with Washington and Tokyo. Seoul’s agreement last December to ink a trilateral military information-sharing arrangement with the two security partners has apparently unnerved Beijing. Beijing has also pressured Seoul to participate in the Asia Infrastructure Investment Bank despite Washington’s objections. The AIIB is seen as a scheme by China to lead the regional financial order, which has long been dominated by the U.S. and Japan. China’s pressure on South Korea to take its side is expected to escalate as China seeks to build a “community of shared interests and common destiny” with neighboring countries amid its stepped-up peripheral diplomacy. The U.S.’ enhanced missile defense ― irrespective of its locations on the U.S. mainland or abroad ― has been a source of concern for China as it could undermine China’s capabilities to ensure deterrence through the threat of a retaliatory nuclear strike. Since its first nuclear test in 1964, China has maintained a limited nuclear arsenal apparently based on the belief that with a small number of nuclear arms it can ward off nuclear aggression and blackmail, and join the ranks of nuclear powers to foster national pride. But the U.S.’ fortified missile shield could complicate China’s nuclear strategy ― deterrence with the threat of massive damage to its adversary through assured retaliation ― and make the emergent Asian power more vulnerable to foreign attacks. Robust deterrence can be established when there is a clear prospect that an act of aggression will lead to unacceptable damage in return. But when a potential adversary believes it has a defense mechanism strong enough to counter a retaliatory strike, deterrence could crumble. The two foes also refrained from strengthening missile defenses to maintain “strategic vulnerability” to nuclear retaliation, thinking that the other side would avoid making an irrational decision due to the risk of a nuclear counterstrike. Though it is still difficult to determine the true intensions behind China’s opposition to THAAD, China could think that setting up America’s beefed-up missile defense near its territory could further limit its retaliatory capability, or second-strike capability. By and large, China’s nuclear strategy has been seen as deterrence-oriented due to its relatively small number of nuclear warheads. China possesses some 250 nuclear warheads ― the lowest figure among the five officially recognized nuclear powers, according to the Global Nuclear Weapons Inventories in 2014, which was compiled by the Bulletin of Atomic Scientists. The U.S. has about 7,500 nuclear warheads including more than 1,920 deployed strategic warheads. Given the imbalances in the nuclear quantities, ensuring a reliable and sustainable second-strike capability is crucial for an ascendant China, particularly amid its intensifying strategic rivalry with the U.S. in the Asia-Pacific. At the core of a nuclear power’s second-strike capability is submarine-launched ballistic missiles as these can be fired from undetectable locations at any time, making the launches almost unpreventable. Although there also has been an imbalance in the nuclear-armed submarine forces between the U.S. and China, China has been pushing to bolster its sea-based nuclear deterrent to reduce the gap with other nuclear powers. Whatever methods a nuclear power utilizes to secure its second-strike capability, what is evident is that no nuclear power can defend itself against massive nuclear strikes ― a reason why the U.S. missile defense program aims to defend against “limited” ballistic missile attacks. But the controversy surrounding the deployment of THAAD is likely to remain a source of diplomatic and military friction between Beijing and Washington, and between Beijing and Seoul, as long as the distrust between the two major powers continues.